Ready to blow: windchILL in Harrisburg. Photo by Leon Laing. Eminem named his last two albums Relapse. On those gripping albums, Em highlights some of his obstacles, such as drug abuse. windchILL — also a white rapper — links his new album title to medicine, too. There is a difference, though. On windchILL’s Self Medication album, the Mechanicsburg-based backpack rapper uses music for a natural high. But the subjects on the new disc aren’t all hunky-dory. On “Self Medication Intro,” chILL, 30, reflects on his 6 month-jail bid that he served at age 19. Music helped to save his life, he adds. The song’s dramatic piano melody and eerie violin strings accentuate chILL’s narrative. Then he incorporates politics on “Give It All” (featuring Analytical): “If George Bush is Christian, I’m loosing my religion,” he affirms. The 90s aesthetic is inching its way back to urban culture. And chILL’s evident affinity for 90s hip-hop can be heard on songs such as “Give It All.” The song samples 90s rhyme spitter Buckshot, and its boom bap sound and scratching suggest the days of Timbs, Biggie and Dr. Dre’s The Chronic album. By the middle of Self Medication, the songs (“A Beautiful Girl Named Katrina” and “Can’t You See”) become more melodic. And the posse track “Can You Remember” stands out. On “Can You Remember,” local artists chILL, Apollo’s Sun, Phynite and DC-based lyricist Ardamus paint vivid pics of yesteryear. The jazzy “Self Medication Interlude” and suave “I Like Ya Style” (featuring Dexter Kendrick) help to give the album more diversity. On “1st Day,” producer Verbal Kent (from New York) begins with a sample reminiscent of a song from a James Bond movie soundtrack. Eighteen seconds into “1st Day,” Verbal Kent cleverly alters the sample, which remains the backdrop for the rest of the song. The national and international producers help Self Medication to be a solid follow up to 2007’s I Have Arrived … Other contributors for Self Medication include DJ El Zink from France and producers from Germany, Switzerland, Italy, Romania and Canada. 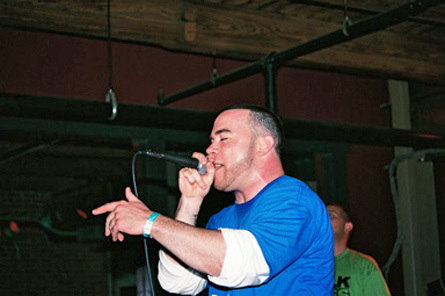 As a hip-hop purist with a good work ethic, chILL is a staple in the local hip-hop community. He contributed with projects including his two conscious albums and a local artist showcase called Mid Tempo Thursdays. Did I mention that he runs his own label (Fist Up Records) and has opened up for celebrity rappers? Witness him live when he opens up for Method Man and Redman on Feb. 26 at Lancaster’s Chameleon Club.